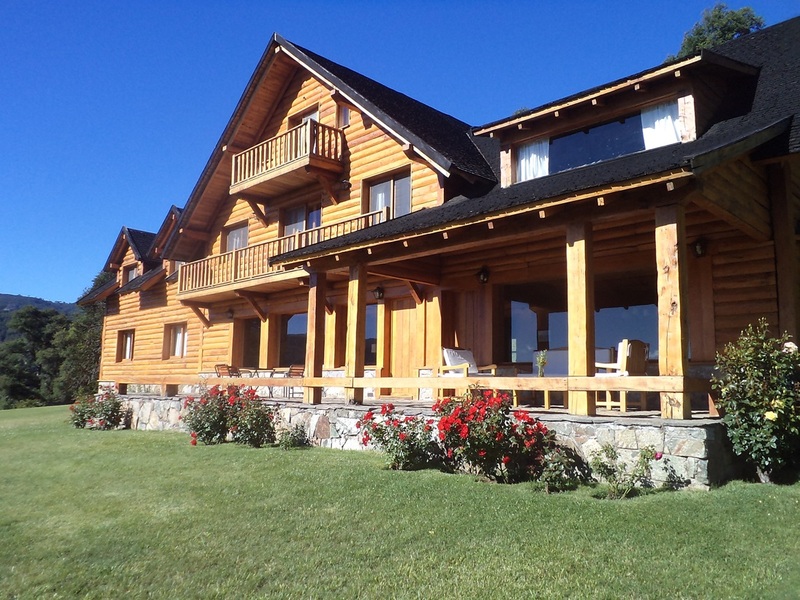 Two of the best lodges in Argentina during peak dry fly season! Telluride Outside is pleased to announce a January trip to Argentina to fish with our great friends at Traful River Outfitters. We will fish two of our favorite lodges for 8 days days during peak dry fly season. Our January 2018 trip will be hosted by Telluride Outside co-owner Ron Solomon who has personally visited these lodges numerous times over the past 12 years. Flowing between spectacular lakes in remote Andes high country, the Filo Hua Hum offers some of the most exciting trout fishing in the world. Words simply cannot describe the beauty of this river, nor the quality of the fishing. The Filo's natural lakes filter its water to supreme clarity. Aquatic insects are abundant, but the river's heavy browns and rainbows feed opportunistically on large terrestrials. This is classic high stakes sight fishing. We commonly use 2X leaders over 12 feet in length to provide the combination of stealth and strength required to catch these stunning fish. Tres Rios Ranch overlooks the first mile of the mighty Collon Cura River, just downstream from the confluence of its two headwaters tributaries, the Alumine and Chimehuin. Tres Rios, dwarfed by a grand landscape, offers several miles of exclusive private water on some of the finest trout streams in Northern Patagonia. Staying at Tres Rios, we will split our time floating and wading these wonderful rivers. The Chimehuin features a 10-mile float that terminates at Tres Rio Ranch [last mile of the "Chime," above]. The gentle riffles and runs of the Chimehuin offer classic match-the-hatch dry fly opportunities, highlighted by mayflies, caddis and abundant terrestrials in the peak summer month of January. Jan 16th: depart San Martin mid-day for Buenos Aires. Depart Buenos Aires late pm for the U.S.
April 27th: depart San Martin mid-day for Buenos Aires. 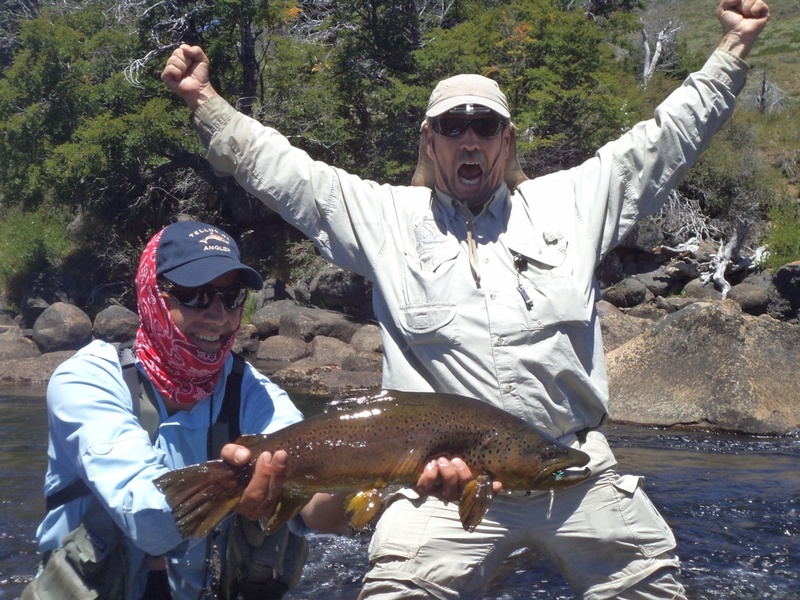 Depart Buenos Aires late pm for the U.S.
Our fishing begins in the picturesque Quillen Valley, which hosts a tremendous variety of fly fishing opportunities. The Quillen River offers daily dry fly action on its wandering glides and riffles, but the real secrets in this watershed lie in the tributary creeks and Lago Quillen. The Malalco River is one of several important tributaries that crawl down through the hills. Some of these creeks are high gradient (similar to the San Miguel River), but the trout feed on the surface for most of the day. Sight fishing is truly rewarding in these well-structured streams because the angler must cast carefully around rocks, logs and other obstacles (huge brown from a Quillen trib, right) Anyone who has fished SW Colorado will feel right at home, except the fish are all wild and many are large. Lago Quillen, a large natural lake at the headwaters of the Quillen River, is nestled between the steep forested foothills of the Andes. This lake is both a great surprise and tremendous opportunity. Anglers may choose to fish the lake on one or more days. Many who consider themselves “pure river anglers” are simply overwhelmed by the lake’s beauty and proclivity of the Quillen’s trout to eat dry flies. Profuse aquatic insect hatches provide exotic dry fly fishing throughout much of the summer and fall season. An afternoon on Lago Quillen may permanently change your preference for fly fishing on lakes. The Quillen Lodge (right) sits on a bench at the western end of the valley. Overlooking a sprawl of agricultural land and green space, the views from the lawn are pastoral and transcendent. The timber and stone lodge is warmed by a great fireplace, around which the day’s fishing stories and evening’s wine are shared in equal measure. Staying at Tres Rios, we will split our time floating and wading these wonderful rivers. The Chimehuin (left) offers a 10-mile float that terminates at Tres Rio Ranch. The gentle riffles and runs of the Chimehuin offer classic match-the-hatch dry fly opportunities, highlighted by a tremendous Blue Winged Olive hatch in April. Sight fishing opportunities abound in the air clear water of this gorgeous freestone river. Tres Rios holds an exclusive lease on the lower miles of the Chime, so our guests have a unique opportunity to wade this river near our lodge. It’s amazing how different a river can fish on foot. In the words of head guide Lucas Rodriguez, “The Chimehuin is a big river that we fish like a small river.” Incredible opportunities lie just out the front door at Tres Rios, including wading and floating all three rivers, and stalking heavy rainbows and browns on the ranch’s spring creeks. 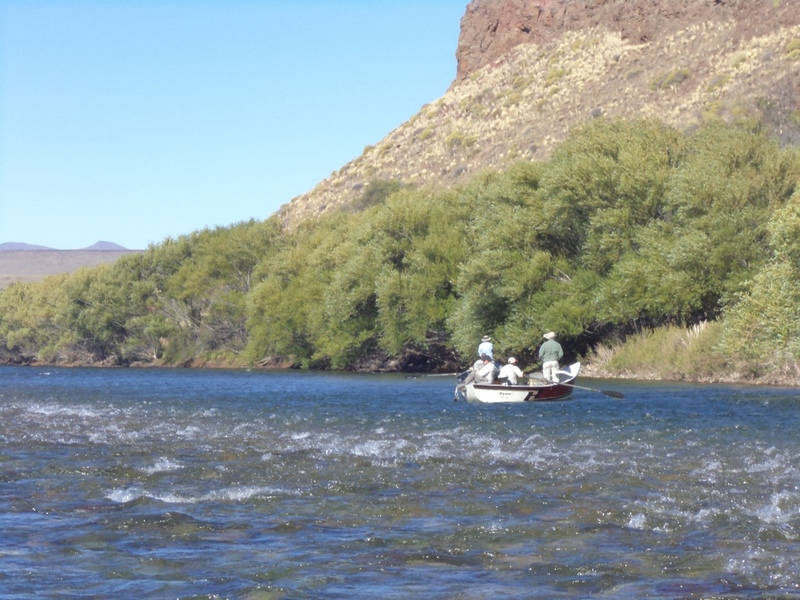 Our trip concludes with two days of fishing on the Malleo, perhaps the most famous dry fly river in Argentina. We stay at the magnificent centennial estancia known as San Huberto, where the hospitality of our hosts is surpassed only by the dry fly fishing on the unparalleled Malleo. San Huberto owns 27 miles of the best water in the Southern Hemisphere. 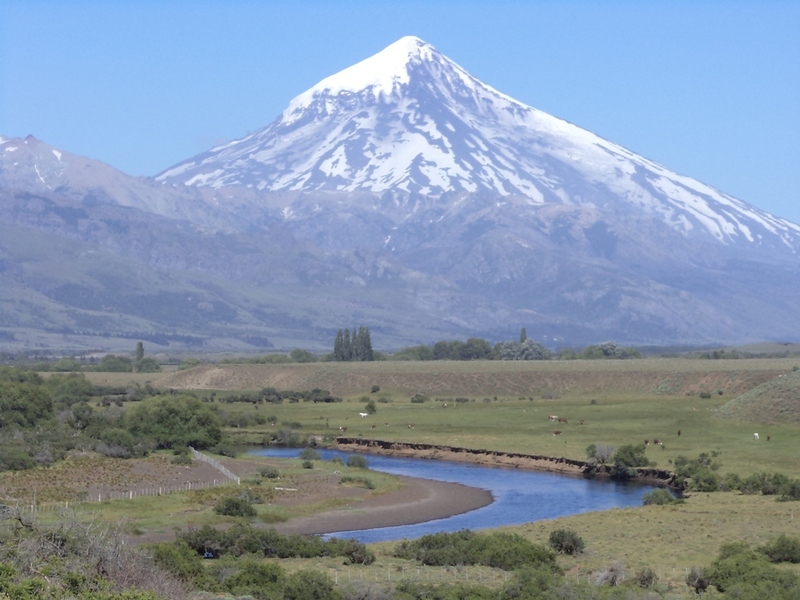 Volcan Lanin, with its stunning hanging glacier, provides constant surveillance for every dry fly cast (right). The Malleo is a place to test your match-the-hatch skills as the daily emergence brings trout to the surface. There are few rivers in the world that provide such a compelling aesthetic experience. The Malleo burns in the memory of every angler so fortunate to grace its waters. Our April 2018 trip will be hosted by one of the owners of Telluride Outside. Our host will iron out all of our travel logistics in Buenos Aires, including airport transfers and accommodations. Your mandatory layover night in Buenos Aires will be a surprise highlight of the trip. Lodging, all meals, drinks, bilingual guides, 4wd vehicles, drift boats, motor boats; transfers in the area, liquor, light tackle supply, licenses. Phone calls, laundry, lodge staff and guide gratuities, and fishing gear. If arriving and or departing from Bariloche Airport additional charge of U$65 per pax will be charged. Temuco-SMandes area ground transfer surcharge based on 4-6 pax: U$650 each way. A deposit of 50% confirms your reservation (dates, rates and locations). Deposits are NON- REFUNDABLE unless client replacement is found. Final payment is required 45 days prior to your departure date. The purchase of travel insurance is required for each confirmed individual on this trip. Our accommodations and guides at The Villages at Christmas Island have consistently exceeded expectations and there may be no place in the world that offers such mesmerizing sight fishing. a) It's small, lodging only 12 guests. The Captain Cook, by comparison, lodges 30 guests. b) The food is terrific. c) Rooms are air conditioned. This is unique on X-Mas Island. d) The guest-to-guide ratio is 1:1.
e) We're on the water, with no drive time to and from the boat ramp. This gives us a full extra hour of fishing time each day. Fishing is timed around the tides, rather than on a set routine. f) There's a flat right in front of the lodge. Bonus fishing time is just a few steps away! Fishing: Christmas Island is one of the finest saltwater fly fishing destinations in the world, truly awe-inspiring in remoteness and quality. 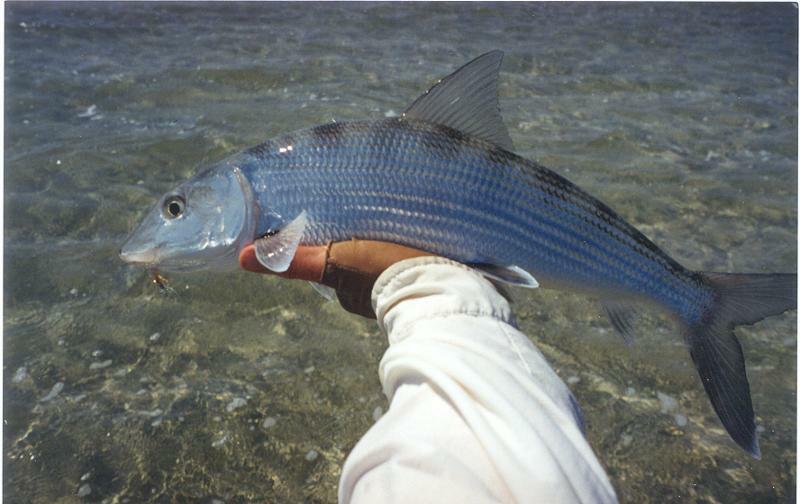 On our 2014 and 2015 trips, we caught countless bonefish on classic flats and several species of trevally, including some in the 30-50 lbs range. Offshore fishing is also available for tuna, dorado, wahoo and other big game species. The flats fishing is 100% wading on super hard, shallow flats. For those who seek fly fishing overload, Christmas Island is an unsurpassed destination. 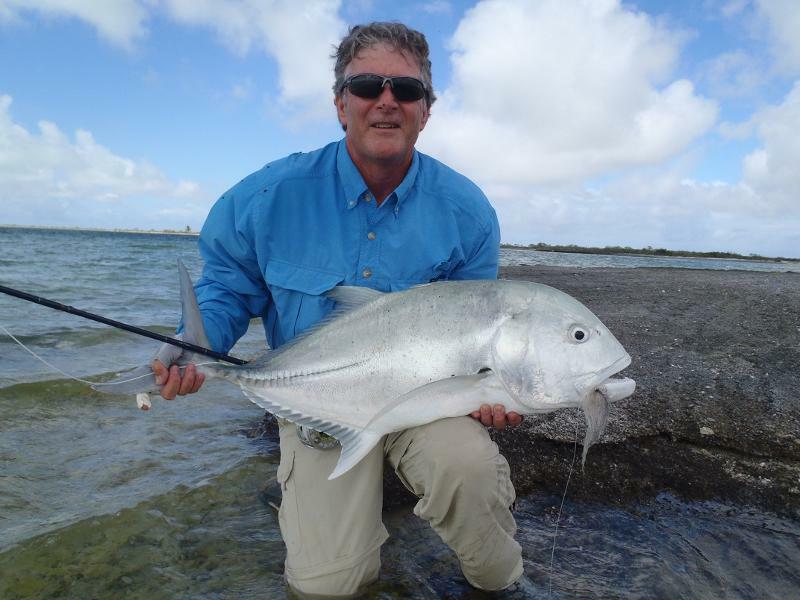 From our experience, Christmas Island is equally well-suited for beginning and expert saltwater anglers. Since we're wading large, hard flats, everyone is in the game 100% of the time, rather than taking turns from a boat. Each angler may fish at his or her own pace. The guide, who fishes with two anglers, takes turns walking with each guest. 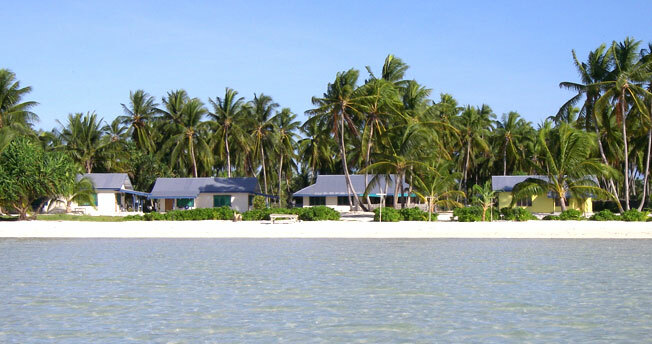 Lodge, meals and guides: $2,590pp 7 nights/6 fishing days, all meals included (double occupancy). Upcharge for single occupancy lodging/double occupancy fishing: + $260. Note: the flight to Christmas Island leaves early on Tuesday, May 3, so it is necessary to arrive in Honolulu May 2. We’ll get some rooms down on Waikiki for Monday night. On the return trip, you may schedule a late afternoon flight back to the U.S. mainland. Our charter flight from Christmas Island arrives in Honolulu around Noon. More on The Villages? Click Here for the Fishabout website.